When Peggy Skeffington-Gretsch was growing up, first in Spokane and later in California, she somehow always knew she wanted to be a music teacher. And when Cooper Elementary School’s bell sounds for the last time this school year, Skeffington-Gretsch is retiring after 34 years of teaching in the state of Washington, with 29 of those years spent in Spokane schools. “When I first started teaching here it was back in the time when a music teacher went to three schools,” said Skeffington-Gretsch. Some of her first schools were Adams and Longfellow, and she hauled all her stuff with her from school to school. 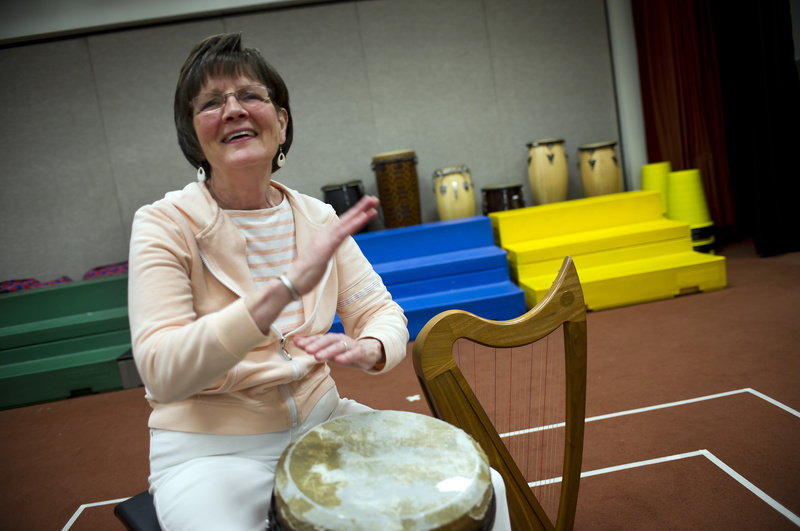 It was a relief to arrive at one school – Cooper Elementary – and have everything in one classroom back in 1999. Cooper was big enough, with more than 500 students, to get its own music teacher, and she was excited when the job came open. She grew up in a musical family. Her dad, Tom Skeffington, was a music teacher and a musician. Skeffington-Gretsch began teaching at a time when music instruction was much more regimented than it is today. Children learned to play an instrument, joined the band and stood at attention during choir recitals. Slowly, over many years, Skeffington-Gretsch began experimenting with other ways of teaching. And she came to discover that many of the children who couldn’t match pitch or duplicate a simple rhythm on a hand drum were struggling learners in other classes. “I feel very strongly that music is a key component for acquisition of language,” Skeffington-Gretsch said. “My teaching revolves around making sure the children can match pitch and duplicate a rhythm.” Some years ago, Skeffington-Gretsch worked with a specific group of students who were struggling. She hoped that if she made them more musical, they would have an easier time of learning. “They improved so much. As a matter of fact, 85 percent of them improved in reading,” Skeffington-Gretsch said. Though her study was small and without a control group, she was confident in her findings and published a couple of articles. That led to her development of a special music program called Reading Through Music. She has been teaching workshops and giving presentations at symposiums and schools about that program since 1998. In later years, other research has duplicated her findings. “In my next life I’m going to write the book,” she said, smiling. With retirement, that next life is knocking on her door now. She’s happy, she said, but she’s sad to leave the kids.